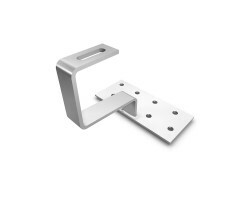 Pan tiled stainless steel fixing bracket non adjustable style. The K2 method of attaching to wooden timers under clay brick roofs is simple and quick to secure permanently. Connect rails for a permanent solar panel structure using these parts. Sold individually or in boxes of 25 brackets, these prices are discountable on the amounts purchased.